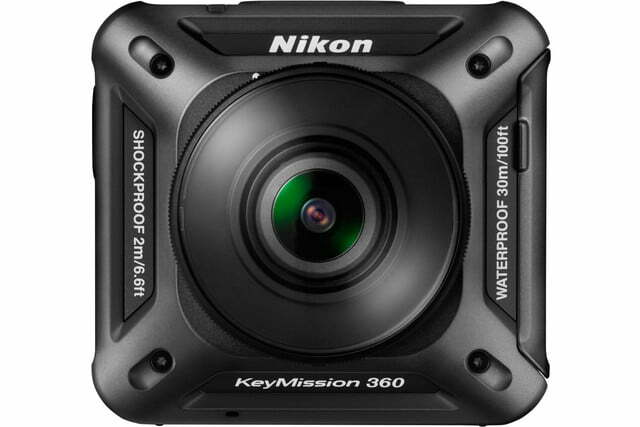 Back in January 2016, Nikon surprised the photography world with the unveiling of the KeyMission 360, a waterproof action cam capable of capturing 4K footage in 360 degrees. There weren’t a lot of details at the time: We knew it’d be rugged without a special housing (waterproof down to 100 feet, as well as dust-, shock-, and freeze-proof down to 14-degrees Fahrenheit). It would also have electronic Vibration Reduction. It’d be Wi-Fi and Bluetooth enabled (SnapBridge-compatible, Nikon’s branding for its Bluetooth Low Energy-based “always connected” protocol), so it’d work with a smartphone or tablet for control. Now, at the Photokina show in Germany, Nikon is revealing more details, including pricing and availability. 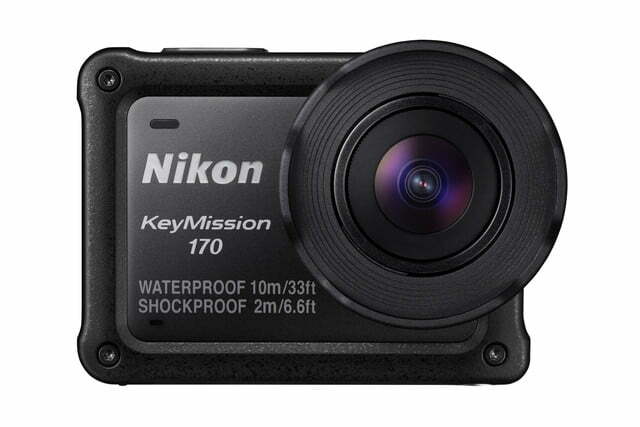 In another surprise, it’s also announcing two additional action cams in the KeyMission lineup – the KeyMission 170 and KeyMission 80 (the numbers indicate the field-of-view their lenses capture). 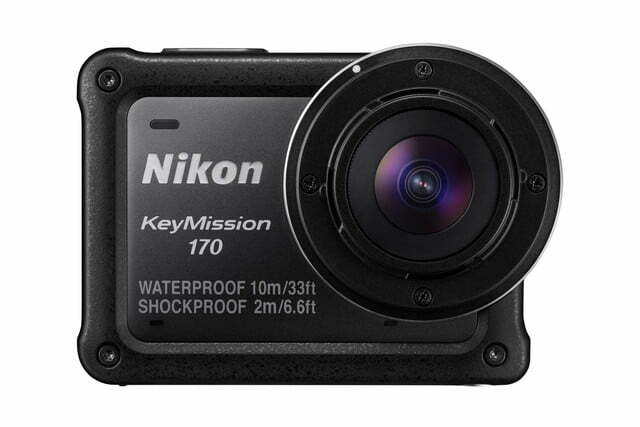 And with these products, the KeyMission series signifies Nikon’s entry into the action cam/wearables category. 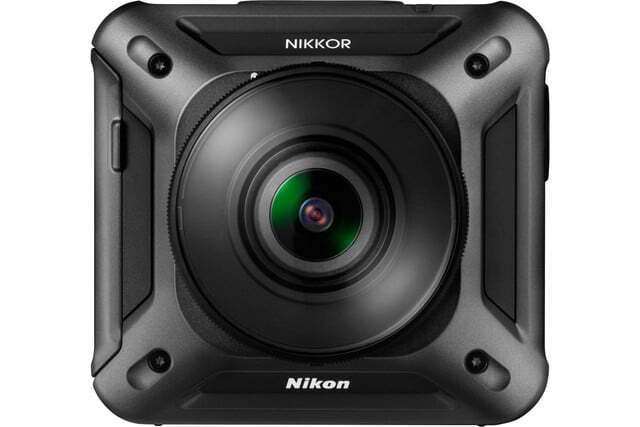 While the action camera market is already full of players, Nikon believes there’s room for more, and that 360-degree cameras are the future. 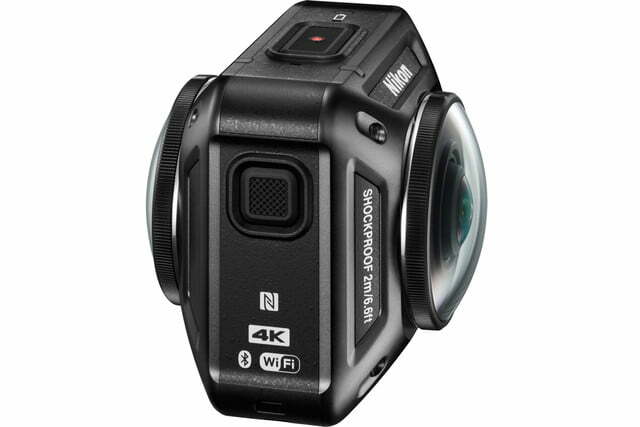 The company told us that it’s not after the action sports market that’s typically associated with these cameras, but more with the general consumer who wants to record his or her life’s moments, when a smartphone isn’t the best option. 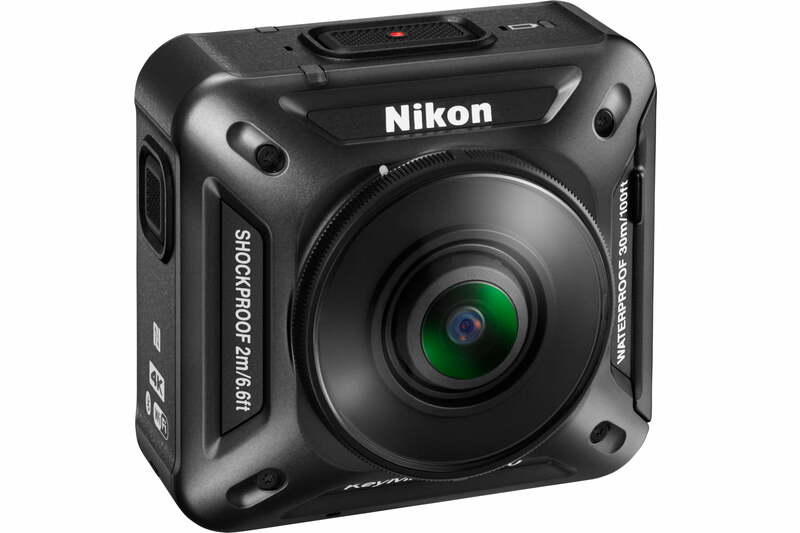 And with sales of its Coolpix point-and-shoot cameras not where they used to be, we can assume Nikon is looking to this new category as an extension of that business. The KeyMission 360 remains the same product introduced at CES this past January, but we have more specs information (the KeyMission 360 shown at CES were non-functioning units, placed under glass). 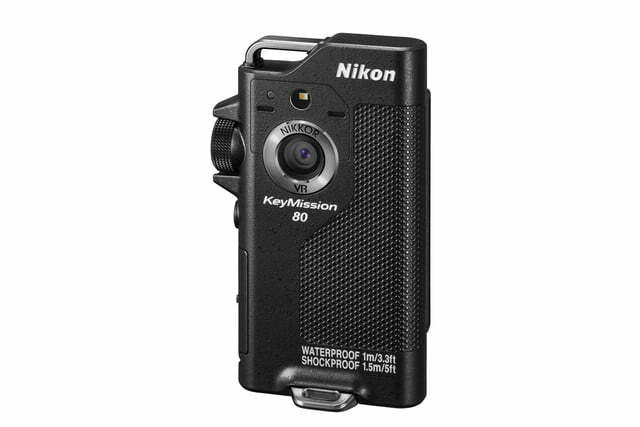 To capture 360-degree photos and videos, the KeyMission 360 uses two 20-megapixel, f/2.0 lenses (1/2.3-inch CMOS sensors); each lens has a 194-degree, and the extra field-of-view is for stitching purposes. The camera shoots up to 4K UHD, but only at 24p. 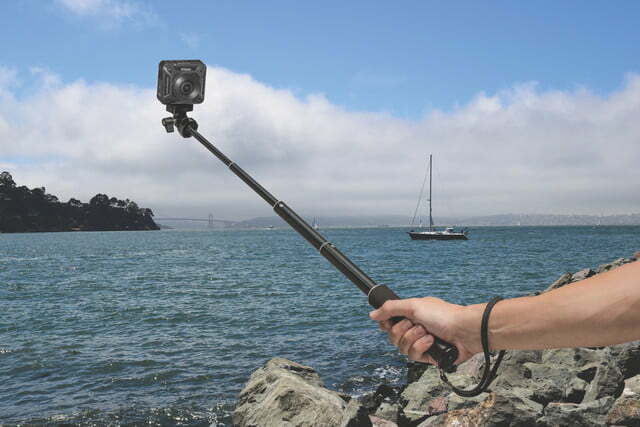 It can also shoot in special-effects modes like Superlapse, Time-Lapse, or Loop Movies. The camera handles stitching internally, rather using post-editing software. Nikon says it is capable of shooting 360-degree content with minimal ghosting of stitch lines and without blind spots (an area where the lens isn’t able to capture). From the sample images and videos Nikon showed us on a large-screen tablet, the stitching does look nearly seamless. The resolution looks quite good, but it’s not exactly as “razor sharp” as claimed during CES, but we’ll reserve judgment until we get some proper hands-on time. 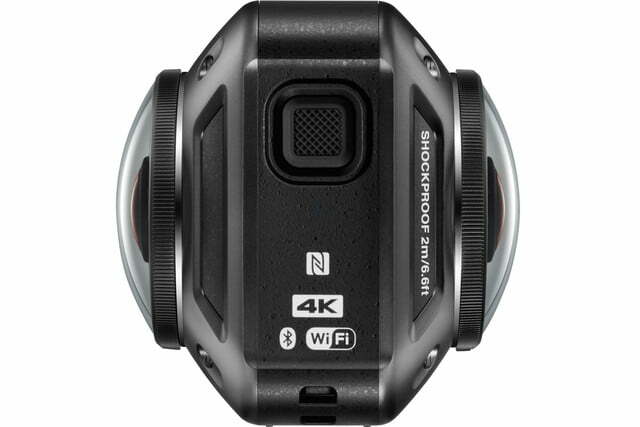 For those looking to take the KeyMission 360 deep into the water, two flat lens guards are included. They help compensate for the distortion created when shooting underwater, but they narrow the field of view. Complementing the KeyMission 360, as well the cameras mentioned below, is a new mobile app (iOS and Android) called SnapBridge 360/170. As with all camera apps, you can see a live view (even while recording, with select models), adjust settings, make basic edits, and share. The app can also upload 360-degree videos with the metadata to YouTube, so you can view and navigate it in 360 degrees during playback. The KeyMission 360 will have an “airplane mode” switch for quickly turning on/off . The camera comes with a more advanced editing software for Mac or PC. Other included accessories are a mount adapter and two mounts, a silicone protective jacket, a cardboard-style head mounted display for immersive viewing. 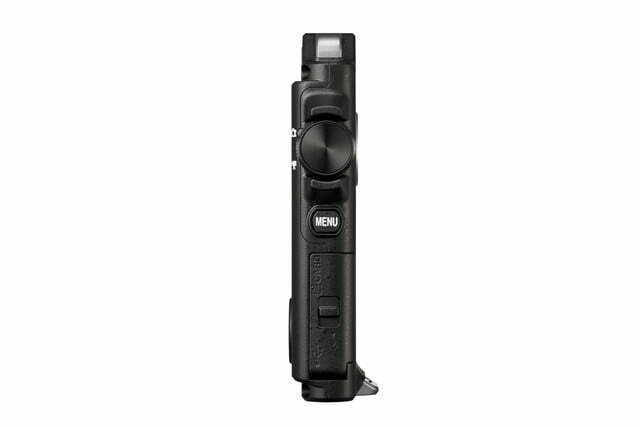 Nikon will also sell optional mounting accessories for the KeyMission series, but the camera has a 1/4-inch tripod screw. 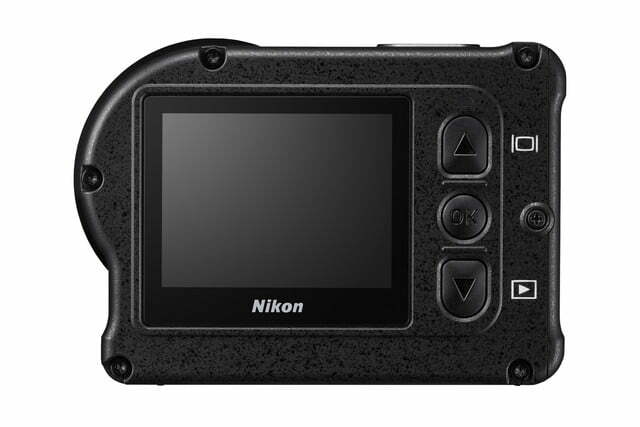 As for battery life, Nikon rates it at 230 still shots and 1 hour 10 minutes of video. The KeyMission 360 will sell for $500, and will be available in October. 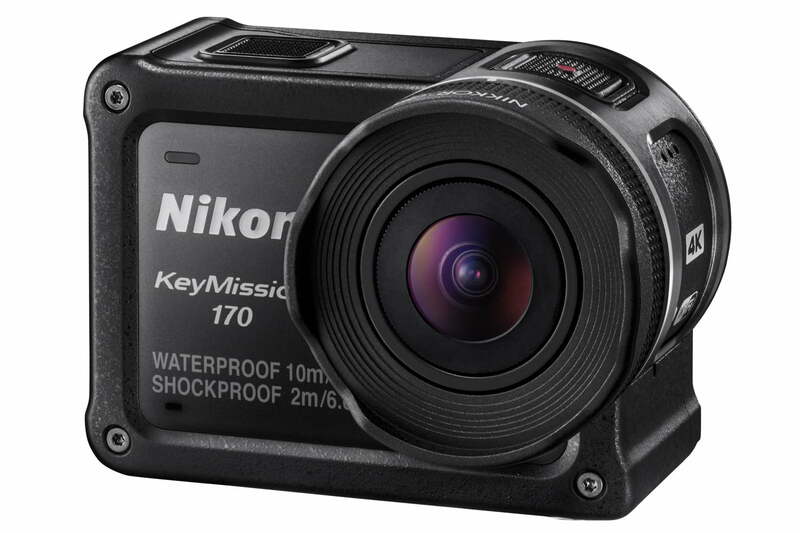 The Nikon KeyMission 170 is a waterproof action cam capable of capturing 4K video (at 30p) with 170-degree field-of-view. 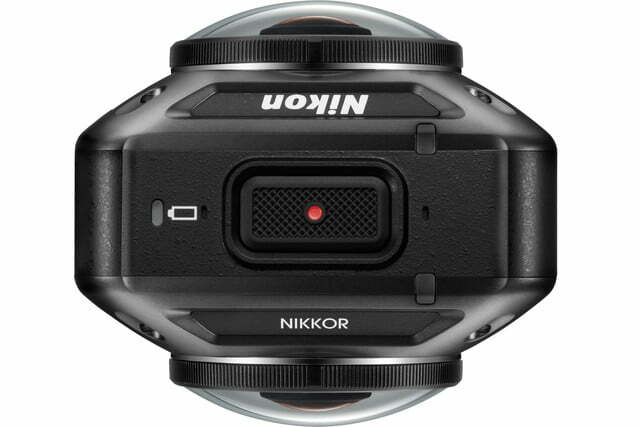 Inside Nikon’s new action cam is a 12-megapixel CMOS sensor (1/2.3-inch CMOS, 8.3 effective pixels) that works hand-in-hand with the f/2.8 lens to capture the super-wide focal length. Think of the KeyMission 170 as the traditional action cam. The device is waterproof to 33 feet, shockproof up to 6.6 feet, and freeze proof to 14 degrees fahrenheit – all without the need of a housing. 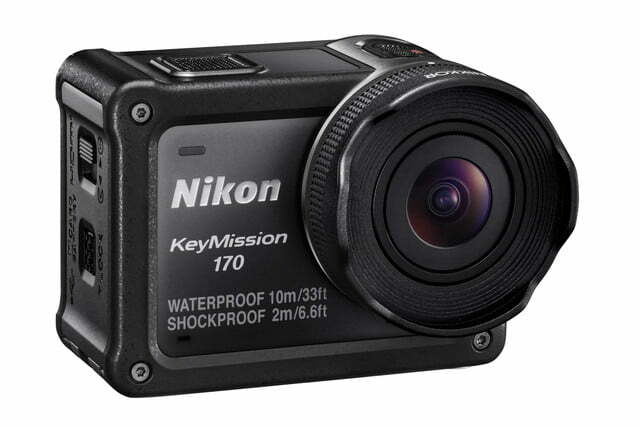 With the optional waterproof housing, however, the KeyMission 170 can operate down to 131 feet underwater. 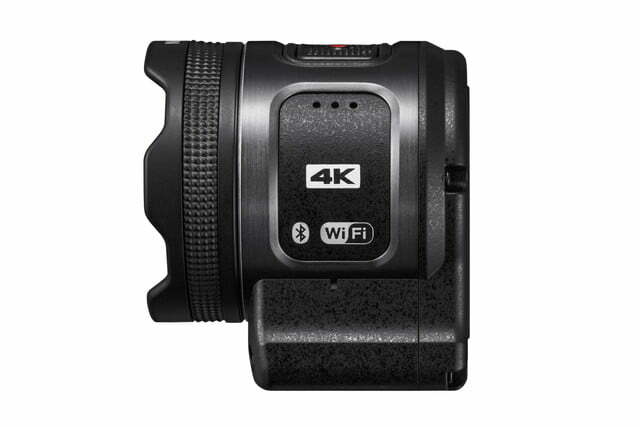 The camera comes with built-in capture modes, including slow motion, time-lapse, and loop modes. It also offers Nikon’s Highlight Tagging feature, which lets you mark certain clips as more important than others when the camera creates automatic movie montages, similar to what GoPro and Sony offer. With the SnapBridge 360/170 app, you can watch a live view video even while recording. 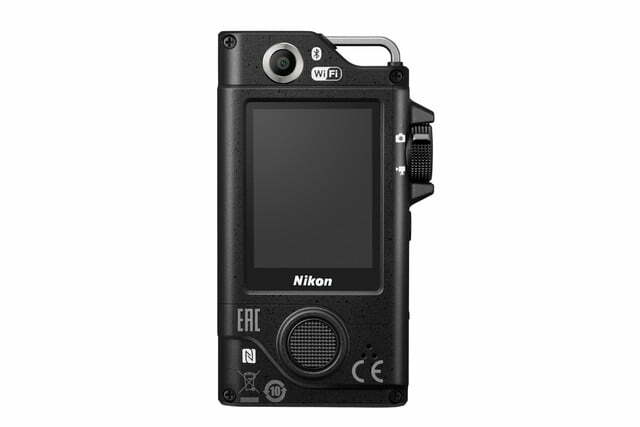 The 1.75 inch LCD screen on the back makes it easy to compose and review footage on the fly, as well as change settings. A remote is also included for wireless control of the camera when it’s mounted in an inconvenient location. 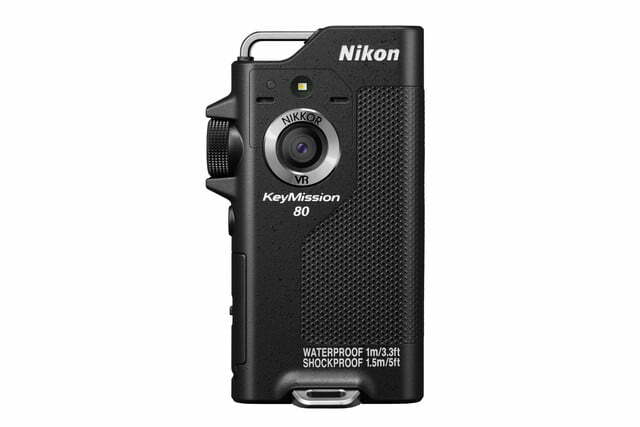 The camera uses the same battery as the KeyMission 360, but here you get 250 still shots and 60 minutes of video. The KeyMission 170 will be out in October, and retail for $400. The KeyMission 80 is a bit of an odd camera of the bunch. 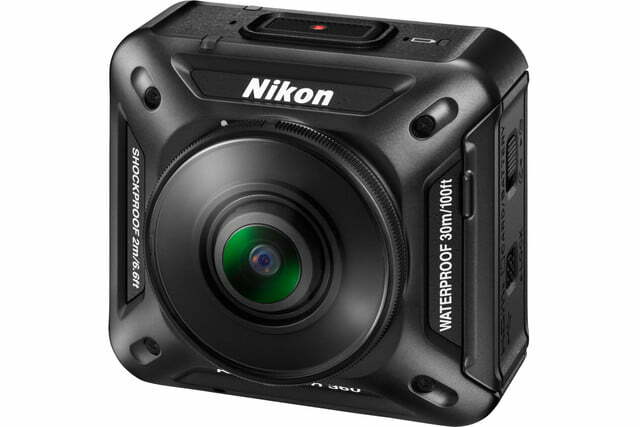 It’s a wearable, waterproof action cam capable of capturing 1080p video with an 80-degree field-of-view. The camera actually has two separate sensors and lenses: a 12-megapixel rear-facing camera with an 80-degree, f/2.0 FOV and a five-megapixel front-farcing camera with a 90-degree, f/2.2 field-of-view. 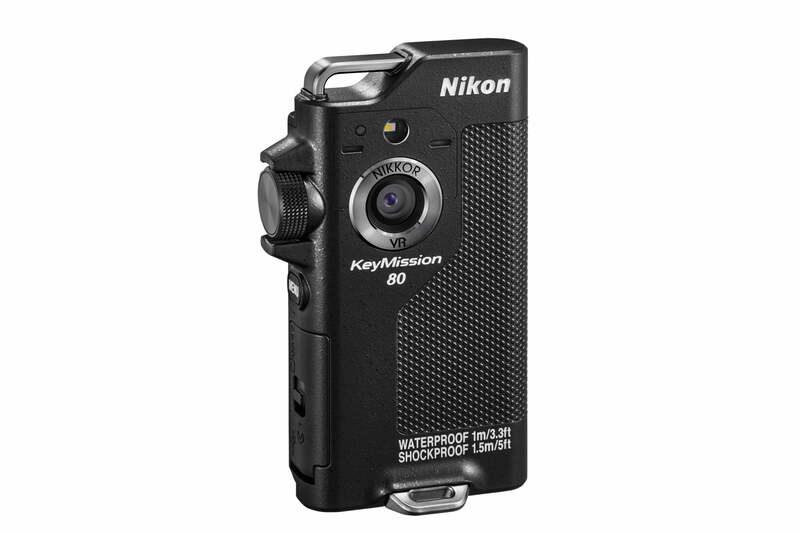 Designed for capturing everyday moments, like a lifelogging camera, the KeyMission 80 can turn on instantly. It won’t do 4K, but it can shoot at Full HD 1080 at 30p. On the rear of the camera is the same 1.75 inch LCD screen found in the KeyMission 170. 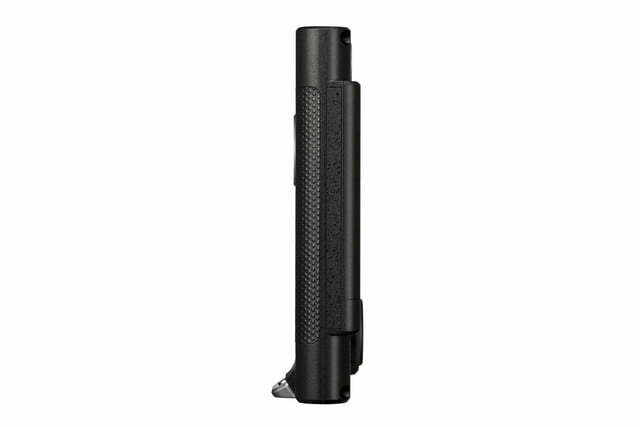 Like the 360 and 170, the KeyMission 80 is waterproof to 33 feet, shockproof up to 6.6 feet, and freeze-proof to 14-degrees Fahrenheit. The camera is slim, small, and lightweight, like a portable voice recorder or Zippo lighter. It’s compatible with the SnapBridge 360/170 app. 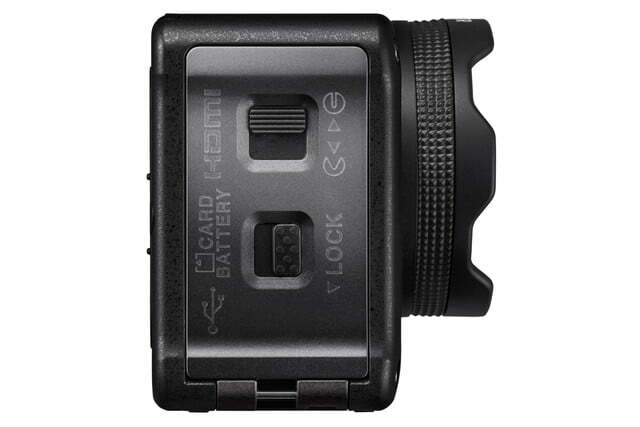 The battery is built-in; it’s rated 220 still shots and 40 minutes of video recording time. The KeyMission 80 also goes on sale in October, for $280. It’s a little pricey for what it is, but the camera seems more like an experiment to see if there’s a market for such a product.